In Brussels, Belgium, Secretary-General Ban Ki-moon addresses the 2016 European Development Days, Europe's leading forum on development and international cooperation. On the second day of his visit to Brussels, Belgium, United Nations Secretary-General Ban Ki-moon addressed the opening ceremony of the European Development Days forum and participated in a commemoration for the victims of the March airport bombing attacks in the city. 2030 Agenda for Sustainable Development was timely and influential, given that the meetings have fostered partnership and innovation for a better future for the past 10 years. For that reason, the 17 Sustainable Development Goals (SDGs) are universal, addressing existing and emerging global challenges, and recognizing that such challenges are faced by developing and developed countries alike, the UN chief said. Acknowledging that developing countries need special attention, Mr. Ban underscored that all countries have inequality and youth unemployment, are vulnerable to economic instability, and need to promote gender equality. “The goals set out a path for the future of our planet, and all who inhabit it. Everyone, including and especially those who live in the most developed nations, has a role to play in ensuring that our planet can support the people of coming generations,” the Secretary-General said. “The 2030 Agenda represents a paradigm shift. It challenges us to rethink how we do development,” he added. In that vein, Mr. Ban stressed that “every effort” should be made to meet official development assistance (ODA) targets. Commending those countries that have met the 0.7 target, he urged all European Union (EU) Member States to do so. “The quality of ODA also needs to improve. And we need better links between development and humanitarian relief,” the Secretary-General said. In addition, he emphasized that the World Humanitarian Summit convened in Istanbul, Turkey, this past month, along with the Agenda for Humanity outlining five priorities that complement the goals of the 2030 Agenda, clearly outlined that leaders must assume their responsibility to prevent and end conflict. Moreover, States must affirm their responsibility to uphold the norms that safeguard humanity, and leave no one behind, as well as change people’s lives by moving from delivering aid to ending need and investing in humanity. “Now we must take those commitments forward, through intergovernmental and inter-agency processes, with regular progress reviews,” the Secretary-General said. “The United Nations counts on your ideas and your partnership to build a better future for all of humanity – for people, planet, peace and prosperity,” he concluded. 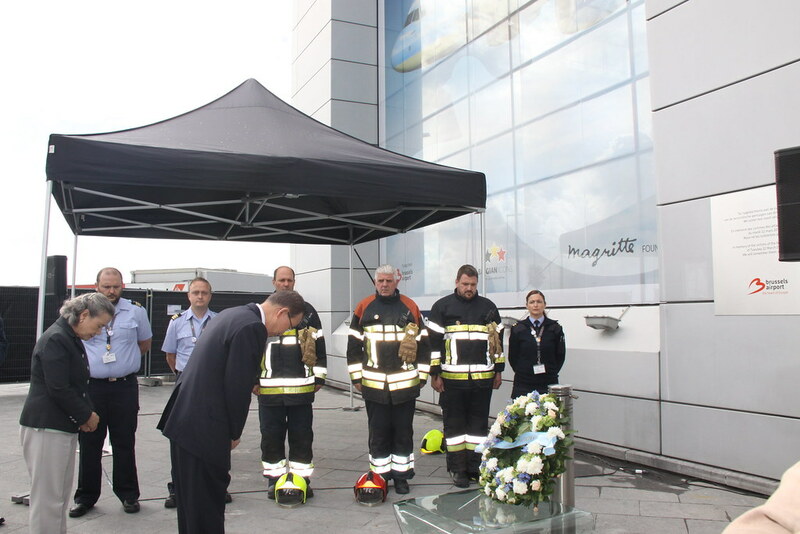 Also today, Mr. Ban laid a wreath at Brussels Airport, in the presence of senior Belgian officials and first responders, to commemorate the terrorist bombings in Brussels. The attacks, which occurred on 22 March, resulted in the deaths of 32 people and many more injuries. “This was a heinous attack not only on Belgium, but on all of humanity. The attack, here at the airport and at the metro station, symbolizes this: the one place where all different nationalities congregate,” Mr. Ban said. The Secretary-General also met with the President of Kenya, Uhuru Kenyatta, and discussed the decision by the Government to close refugee camps, encouraging the Government to work with the Government of Somalia and the Office of the UN High Commissioner for Refugees (UNHCR) in the context of the Tripartite Agreement. 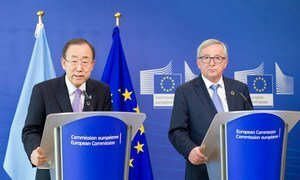 In Brussels, Belgium, today, ahead of the start of a forum by the European Commission, United Nations Secretary-General Ban Ki-moon met with several European officials, discussing such issues as the need for stronger international cooperation in the face of emerging challenges related to terrorism, and also visited with refugees and volunteers working at a soup kitchen.